I love the concept this place! 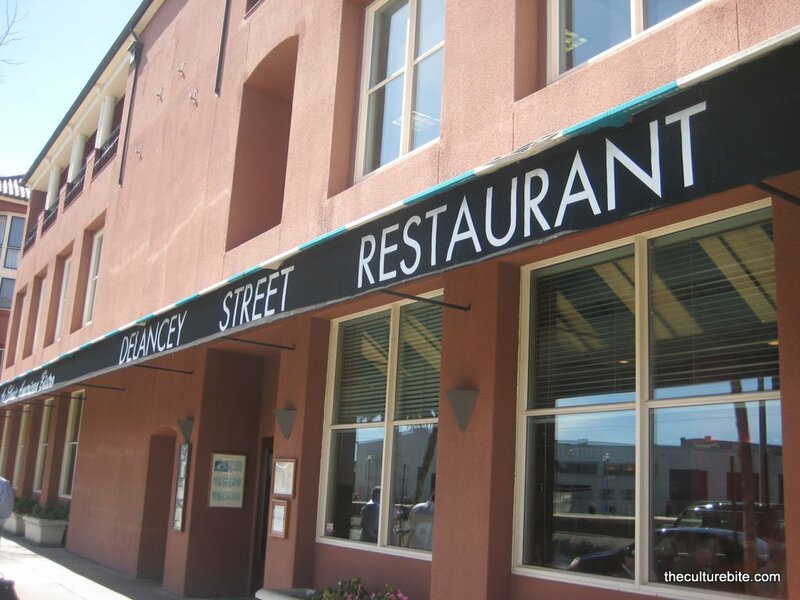 The Delancy Street Restaurant is the “training school of the Delancey Street Foundation, the country’s largest self-help residential organization for people who have hit bottom to completely rebuild their lives.” The foundation also clothes and houses the ex-convicts in the very apartment building in which the restaurant resides. All tips are considered donations, and all restaurant proceeds after food costs go directly to house, feed and clothe our residents and teach all skills, values and attitudes needed for a successful drug-free and crime-free life in the mainstream society. The restaurant actually looks pretty upscale with the white table clothes and emply wine glasses sitting on the table. They even offer vallet parking for only $4. And if you’re lucky, you could be seated next to a spectacular view overlooking the Bay Bridge. The food here is insanely cheap. You could get a full breakfast for only $6 a plate. Orange Juice – This first caught my attention walking into the restaurant. One of the employees was squeezing fresh orange juice at the bar and it looked insanely delicous. The juice was semi-pulpy and sweet, just the way I like it. Strawberry Pancakes – At only $5.75, this dish was impressive. The pancake batter was made from a strawberry puree. I couldn’t believe how strong the strawberry flavor was in the pancakes. The pancakes had a soft chewy consistency which also indicates a good quality pancake. Southwestern Chicken Hash – K got the Chicken Hash topped with 2 poached eggs. This hash was a healthier version of the usual hash. The spicy salsa on the side added a real kick to the dish. K never had a poached egg before and he fell in love. The oozy yellow center spilled onto the hash making it super moist and creamy with each bite. Cake Moda Cupcake Wars - $22 Sale!